You walk off the plane, proceed through immigration, grab your bag from the luggage carousel (or not, if you travel really light) and walk through the customs inspection. And there you stand, in the open-air arrivals terminal of the Male International Airport. Welcome to the Maldives on a budget! While you might not exactly find a crowd of budget travelers hanging around the airport, or independent travelers either, you’d be mistaken if you think that these islands are only for the wealthy or those who are ready to splurge big time. The truth is that you really can visit the Maldives on a budget. Fares from the Middle East (ie. Doha and Dubai), India (Cochin) and SE Asia (ie. Kuala Lumpur and Singapore) are as low as $200 USD roundtrip to Male, the main city and location of the main airport in the Maldives. The cheapest I found was with SpiceJet, via India, for $183 USD roundtrip from Dubai. But check out airlines such as Qatar, Emirates, Etihad, Maldivian, Sri Lankan, Spice Jet, Silk Air, British Airways, Malaysian, Air India and more, all of which fly to Male. …on a combination Qatar Airways and Gulf Air ticket, for a total of $580 USD. Not bad for almost 24 hours of total flying. Conclusion: While more expensive than flying to a more popular and convenient destination, flying to the Maldives is not exorbitant at all. It’s extremely reasonable to get here. Well, that takes care of the visa. Sure, you can spend $300 – $1000+ USD per night to stay in a luxury bungalow sitting on stilts above the water on an uninhabited Maldivian island, and that would surely be incredible. But, that will cost you $300 – $1000+ USD per night (plus a crazy amount of additional expenses as you’ll see in a moment). But if you still want gorgeous, palm tree-lined white sand beaches, an uninhabited island to hang out on (covered in more beautiful white sand and with extremely stunning clear water), a long list of awesome excursion options (see below) and that overall sensation of being in a true remote paradise, it’s all very possible on Mathiveri Island. 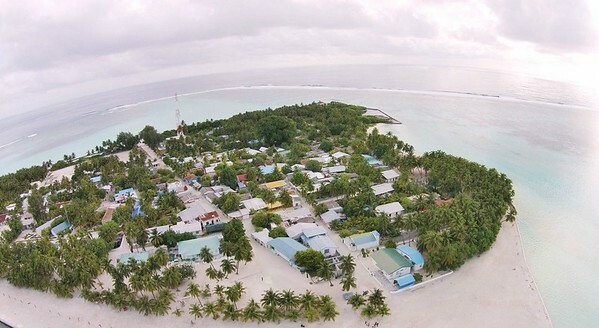 Home to 800 welcoming people, this tiny local island is situated 80 kilometers from Male, it’s about 1/2 square kilometer in size, there are no vehicles on the island and the ‘roads’ are all sand. There are three white sand beaches, plenty of lush greenery and a handful of houses, simple shops and cafes. And most importantly, there are the Mathiveri Inn and Mathiveri Island Guesthouses. 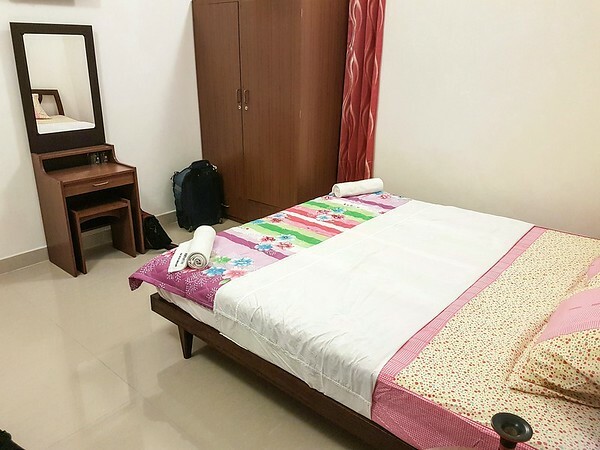 For $60 or so per night (per room), you can stay in a laid-back guesthouse, in a simple, comfortable, private room, with a comfy bed, plenty of space, air-conditioning, a private bathroom and of course, free wifi. Is it pure luxury? Nope. But is it $300+ USD per night? Nope. It’s $60 USD per night (yes, $60 bucks per night) and it allows you to experience the Maldives on a budget! The guesthouses are jointly run and the team of Sameer and Lisa are genuinely passionate about giving travelers a chance to visit this country, and still have the ultimate paradise experience, without having to shell out big money. They work tirelessly to achieve this goal. 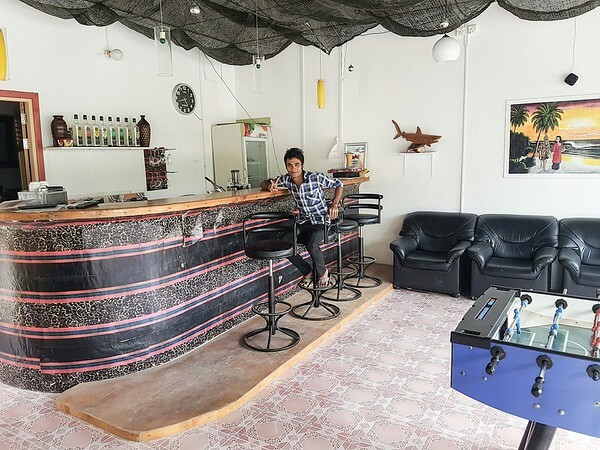 Mathiveri Inn (Mathiveri Inn Guesthouse) – It has a handful of colorful, good-sized rooms, a large lounge area where you can hang out with the friendly staff and other travelers and an attached restaurant where the meals are served no matter which guesthouse you sleep at. It’s a 2 minute walk to the most stunning beach on the island and a 1 minute walk to the main ‘intersection’ in the village. 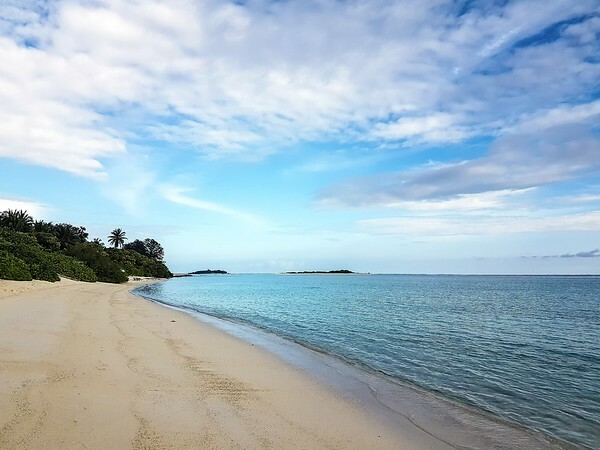 Mathiveri Island Guesthouse (Mathiveri Island Guesthouse) – It’s located only steps from the public beach, which is still beautiful and rarely has anyone on it (but you do need to be covered up on this particular beach). There are four good rooms in a new building with a common room and a laid-back outdoor area with lounge chairs. It’s in a super quiet area, about a six or seven minute walk to the main ‘intersection’ and to the best beach. Whichever you choose, you can’t go wrong. Both are excellent, comfortable budget options that allow you to be in paradise for a ridiculously low price while also enjoying the benefits of experiencing local life in the Maldives. Conclusion: If you want to visit the Maldives on a budget, look no further than Mathiveri Island and its two guesthouses. *Be sure to book directly through the guesthouse websites to get the best rates! Being a tiny island, there really are only a couple of options for food but they are great options. 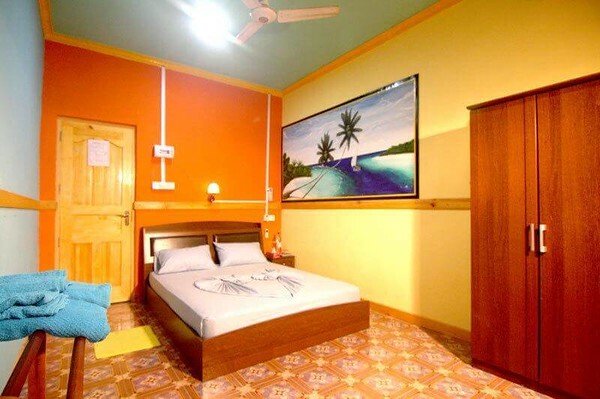 You can book a meal package with the guesthouse or you can order from the restaurant attached to the Mathiveri Inn and pay for meals separately. Meals are reasonably priced, about $10 USD for a full lunch or dinner. 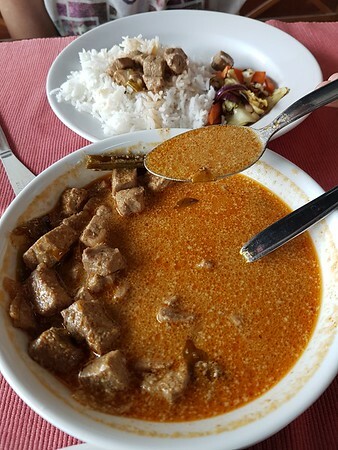 There are also daily lunch menus and a selection of local dishes (excellent fish curry!) and western food as well (excellent seafood pizza!). There is one other place on the island where you can eat…it’s called, Happy Land. Not sure about the name but we ate at this local hangout for lunch several times. 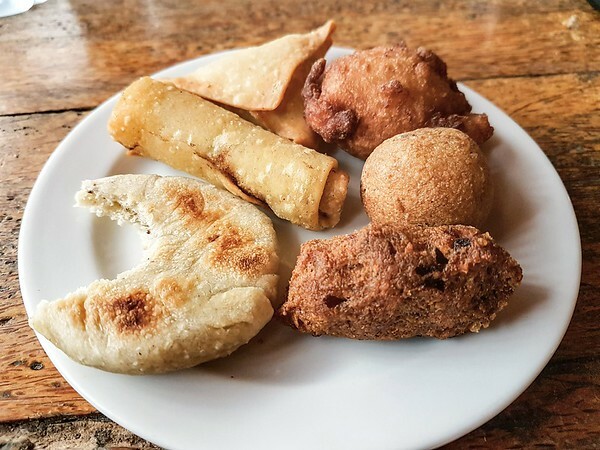 For just a few dollars, you can grab a plate and fill it up with a selection of freshly made snacks – mini-samosas, spring rolls, rice balls, shredded fish cakes and even some sweet pancakes. So good! And they also have great coffee. Conclusion: Good, fresh food for cheap prices. 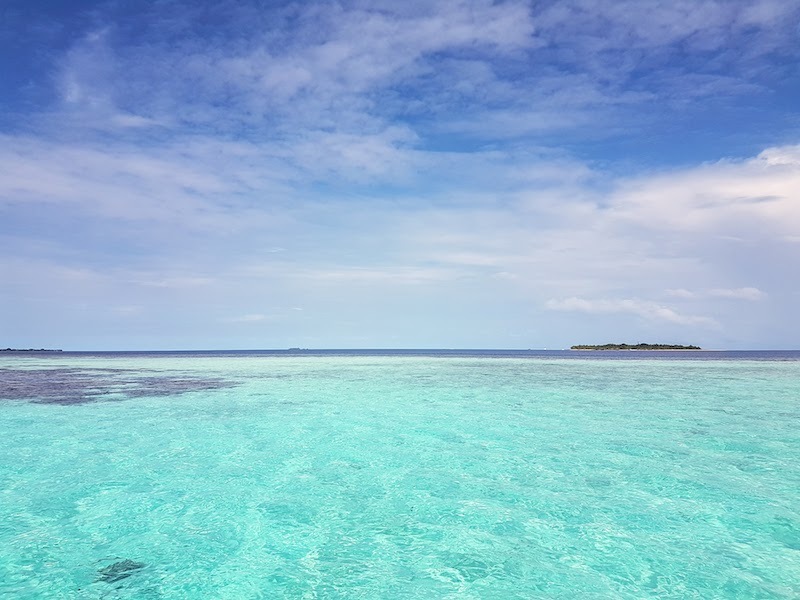 Snorkeling at one of the most mesmerizing coral reefs I’ve ever seen, swimming with huge manta rays in the open water, free-diving around a shipwreck, sunset fishing, island hopping, hanging out on a remote sandbank…it’s all possible from Mathiveri Island. 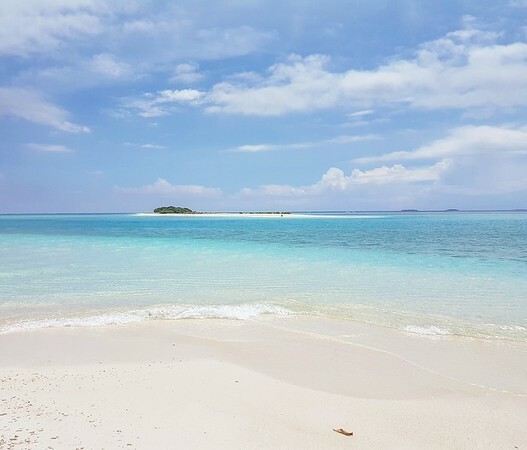 Also, visiting the nearby, picture-perfect uninhabited island, which you can swim to in about 5 minutes from the public beach (or borrow a kayak for a two minute paddle over) is something you’ll want to do every single day, especially at sunset. And this doesn’t cost anything at all. The guesthouses offer great value excursion packages (room, board and excursions combined) or you can book the excursions individually. Either way, you’re looking at a very inexpensive range of $50 – $70 USD per person per trip. I checked at some of the luxury resorts on nearby islands and the exact same type of excursions are priced at around $150+ USD per person. Same amazing experiences, much different price…another bonus of Mathiveri Island! Conclusion: Get ready to explore because Mathiveri offers everything you could possibly want to do in paradise for a fraction of what it would cost elsewhere in the Maldives. You have two options for getting to and from Mathiveri Island. Taking a leisurely 6 hours to cover the 80 kilometers you need to travel from Male, this option only costs about $5 USD per person each way. It doesn’t get cheaper than that! This boat often leaves from right outside the airport (yes, the boat picks you up at the arrivals terminal! ), it only takes 2 hours to complete the journey and it costs around $50 USD per person each way. Both the ferry and speedboat have 2 or 3 departures per day for this route but if you let the guesthouse know your flight details, they can book the most appropriate one for you based on your arrival time. And regardless of which option you choose, the ride to Mathiveri is beautiful and exciting, passing or stopping at dozens of islands, plying across turquoise waters and sometimes spotting dolphins en route. Not a bad way to start and finish your Maldives adventure! Conclusion: $5 or $50…compare that to the $100 – $300 per person (each way) that luxury resorts charge to reach their islands by boat or seaplane! The free wifi at both guesthouses on Mathiveri Island was decent. At times it was working relatively fast and at other times, it was definitely much slower, but overall, you can use it to send emails, check FB and do any basic online work you might need to do. SIM card – Just pop into one of the two mobile network companies that each have an office in the Arrivals Hall (Dhiraagu and Ooredoo). They both offer the same package, a SIM card for $16 USD that lasts 7 days and comes with 2 GB of 3G data. The data was very reliable even way out on Mathiveri Island and allowed me to get all of my online work done. And if you run out of data, you can buy a refresh card from one of the shops on the island. Conclusion: If you need to be connected while on a remote island, you will be connected while on Mathiveri. Absolute awesomeness! That easily sums up my trip to the Maldives. And a major part of that, if not the biggest, was the fact that I was able to spend a week here for such a small amount of money compared to what I imagined such a trip would cost. So, if you want to take a trip to a true tropical paradise (maybe you already happen to be in Southeast Asia or India or Sri Lanka or anywhere near the Middle East), just hop on a cheap flight to Male, catch the ferry to Mathiveri Island and start experiencing the Maldives on a budget! You don’t need to spend several thousands of dollars to make this a reality! Anyone interested in going to the Maldives? Does this sound like your kind of destination? Any questions about making this happen? Hi Derek, based on your recommendation, my husband and I took a vacation to Maldives and stayed at Mathiveri Inn. We had a wonderful trip. The snorkeling was fantastic and we really enjoyed our swim to the uninhabited island nearby. There are now 3 additional restaurants on the island in addition to Pizza Palace. I am an avid reader of your blog. Thank you so much for all the great info. That’s wonderful to hear Shalini! Thank you for letting me know and for sharing about the additional restaurants on the island. That’s definitely helpful as they definitely could have used some more food options! Hello Derek. I’ll be on Maldives this May 3. Is snorkling free of charge? Or do i have to attach with a tour course? Hey Maia – It depends. Some accommodation will give you free snorkeling equipment and if you are on an island that has good snorkeling right off the coast, you can walk right in. But for many islands, you need to take a boat trip to get to the reef so that costs money. Derek hello!! Your post is sooo impressive. I’m Julia from Ukraine and I’m totally obssessed with a thought to go to Maldives, but all the tours I check from time to time are insanely expensive. Expensive like hell! Hey Julia – Try websites such as kiwi.com, kayak.com and google flights. Those should give you the best options for flights to the Maldives and I really hope it works out for you! Nice! We have always wondered if it’s possible…may have to add it to the endless list of places to visit! Hey Jonny – You can make that happen my friend! Honestly, keep an eye out for dirt cheap airfares from the Middle East, Asia and occasionally Europe! Are there any snorkeling trip organized by locals? What marine activities do you recommend most? 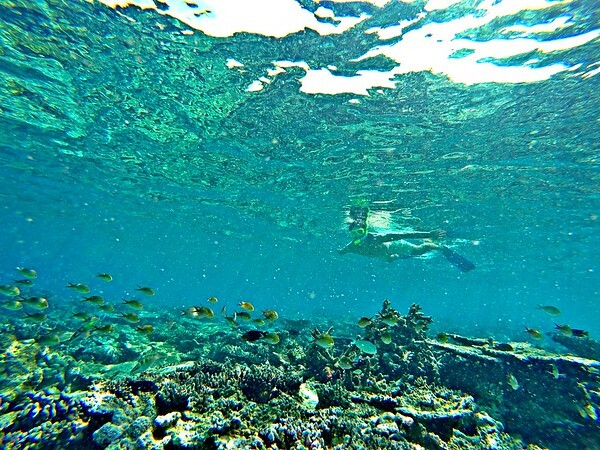 Hey Hajar – You can easily book a snorkeling trip at the guesthouse. It’s extremely affordable and an awesome day out on the water! 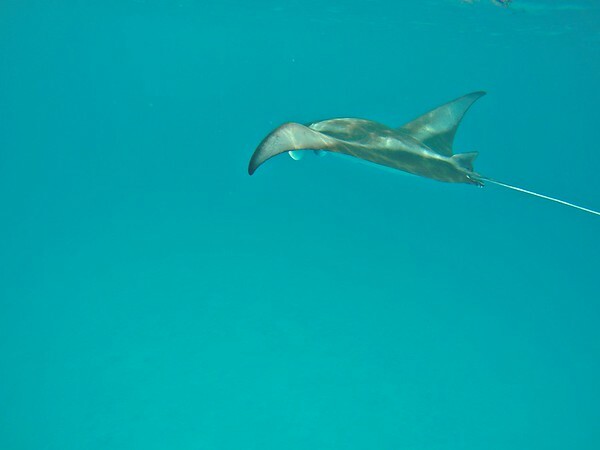 You can also go scuba diving but the snorkeling and swimming with the manta rays was quite surreal and well worth it. This is one place in the planet that I really “awed” for, with their majestic blue green beaches, shimmering golden sands and infinite blue sky above it. Just Paradise on earth! that sound like an amazing trip mate! thanks for the advice. perhaps can do this trip around lunar NY 2017. any advice on where to depart? will check out Hongkong or BKK maybe should just follow your post and try for KL or Singapore. Hey Jake – The trip will take place probably around July as that is one of the best months to visit this part of the Maldives. And for departure, anywhere like BKK or Singapore or KL would be ideal from SE Asia! Not too sure about Hong Kong. Definitely a reasonable range for someone in my position … might have to work it into my plans in the coming months! The ship wreck snorkeling is something I’ve got to try! Thanks for showing the new activities. This sounds like an excellent way to see the Maldives without having to sell your house lol! I’ve been hearing good things about the destination of recent, as it seems to be opening up to independent travellers. I’m not one for beach destinations (I just don’t know why), but I’d be willing to try! Good Job mate! Thanks Victoria! And definitely give the Maldives a try…you might be surprised! Really loved your video tour of Mathiveri Island, Derek. Hope you make more of these in the future. For your readers here in Canada, flying all the way to the Maldives would at least require 2 – 3 weeks of our time to make it worthwhile. Any recommendations on what to pair up a trip to Maldives with? Are there any nearby Indian Ocean islands that one could travel on a budget to? 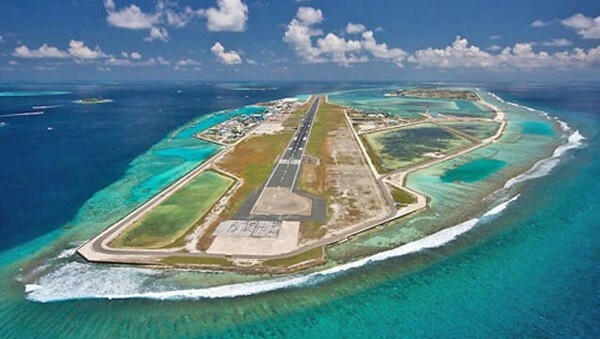 Or any suggested budget layover destinations you’d suggest spending some time on the way back home from the Maldives? Hey Ray – It’s easy to pair up with India, Sri Lanka, Malaysia or Thailand! No other island nations nearby though that would be reachable without spending a fortune unfortunately. I’m just looking at using some frequent flier miles to get to the Maldives in late winter – thanks for the tips Earl! Ok, I’m sold. I’ve been to The Maldives once before (about 14 years ago) but that was on a VERY different budget to the one I travel on now. So I’m definitely going to have to find a week or so to tag on to the end of my 2017 Asia trip. Thanks for the tip, Derek!! Hey Chetan – I have not been to those islands. I did look at visiting Lakshwadeep a couple months ago but Maldives ended up being easier. Would love to visit at some point though! When you say cover up on the beach, do you mean you have to wear long sleeve shirt and pants? And a head covering? To go in the water? Hey Debbie Ann – For the one public beach, you generally aren’t supposed to wear a bikini or show too much skin and it’s better to wear longer shorts and a t-shirt. It’s not a strict rule but it is appreciated on that beach only. On the other beaches, it’s okay to wear any kind of swimsuit. You don’t need a head covering anywhere though. What about other islands than Mathiveri? Is it possible to hop from islands to islands and find other cheap guesthouses like that?? Hey Jeff – From what I know, there are a couple of other islands that have guesthouses but the thing is that the islands are very spread out. 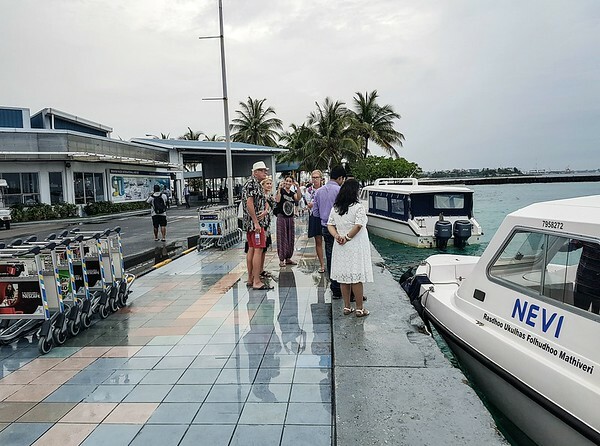 So you would quite possibly have to take a ferry back to Male and then take another ferry or a flight to reach one of the others. But you can use Mathiveri as a base and easily reach a dozen islands for day trips, all within 30 minutes or so by boat. Beautiful! Amazing! Nice video. Are there any dive shops nearby or on any of those excursions you mentioned, to rent O2 tanks or that have group dives? Hey Sarah – Yes, the guesthouse also can arrange diving trips. Not sure why I didn’t put that in the post! I didn’t dive but it is definitely possible. I’ve got a week to kill in late January 2018 – finishing a 2 week land tour in Myanmar and then need to fill a week before I head to Auckland to pick up a 30 day cruise around NZ and Australia, etc. It was either go to Angkor Wat or head to some nice beach R&R in the Maldives. Angkor Wat was winning out due to cost comparisons, but you’ve given me new hope! Thanks! Hey Sherita – That’s good to hear! Definitely check out Maldives! I definetly will! Thats great info. And surely notify me of a maldive tour if organized. This is incredible, is was talking last night about this with some friends. Definitely i’ll visit this place someday! Thanks for sharing. Such amazing value. Might be heading to the Maldives in 2017! Ha…definitely possible for WAY less than that! I feel compelled to let you and other unassuming would-be travelers know that the Maldives is an extremely dangerous place for tourists. I have experienced this firsthand. Violent crime is common and has recently affected not just locals, but tourists as well. Bribery and outright extortion is also common. Please, just consider that before booking a trip there. Derek won’t tell you these things, but you should get the complete picture before making a decision. Hey Paul – Feel free to look at crime statistics and you will quickly discover that the Maldives is very safe, with low levels of crime. Check numbeo.com for example to look at the stats. Derek won’t tell us how dangerous a country can be when travels in them?!? Please! Have you not read his past stories about his trip Yemen or the time he spent found himself being introduced to a group of Taliban members in Northern Pakistan? Derek wouldn’t hide the dangers of the Maldives if he thought they were significant enough to be mentioned. Thanks for that Ray. And honestly, the Maldives is very safe. Anyone can look up the statistics themselves online and see that they have low to moderate crime rates, which is pretty much what the majority of the world has as well.